Discussion in 'Muppet Merchandise' started by Joel Munday, Feb 3, 2014. I check out eBay from time to time and I've never crossed anything like that. If they did, chances are anyone who got it won't be letting it go anytime soon. That would be a very cool item to have! I will keep my eyes open for it! A beautiful Muppet Show 25th anniversary watch was given to guests at the Muppet Show Live performance at MuppetFest in 2001. The pin might have been available at MuppetFest as well. It could be a Henson employee item, but Kermit's eyes are wrong, and you have to wonder why would current(1991) employees get a pin for a show that has been out of production for 25 years? Cast and crew items are usually given during production or to celebrate the end. Usually it is Fans that collect anniversary items from purpose released merchandise. Here it is, it says it was sold at MuppetFest. thank you I don't know if I want it now and Kermit's eyes look wrong to me also. 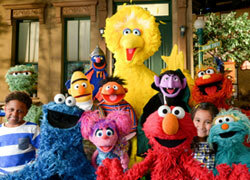 Do you know anything about the Kermit full body puppets by Eden and Applause? 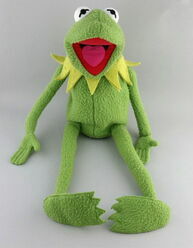 I've seen the Eden Kermit puppet and it is favourable with collectors. 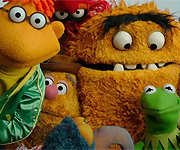 I haven't seen an Applause Kermit puppet.Only plush. I just found my box of all the items I got from Muppet Fest and I have 2 of these 25 years Muppet Show pins. I think I bought these at one of the tables outside the theater. I had forgotten about these.